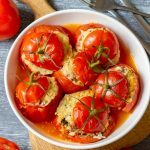 This is an easy and quick recipe for Instant Pot Stuffed Tomatoes. 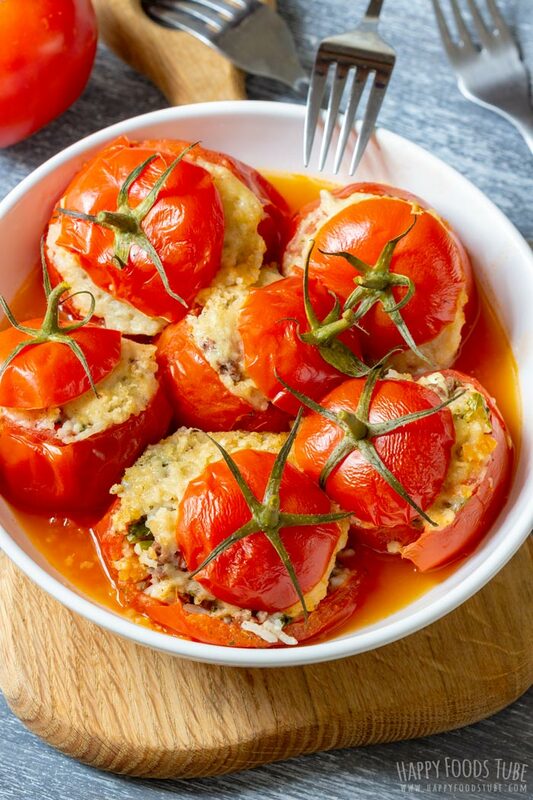 Tomatoes are stuffed with meat and rice and topped with breadcrumbs and cheese. 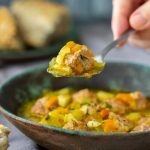 Pressure cooking only takes 2 minutes! 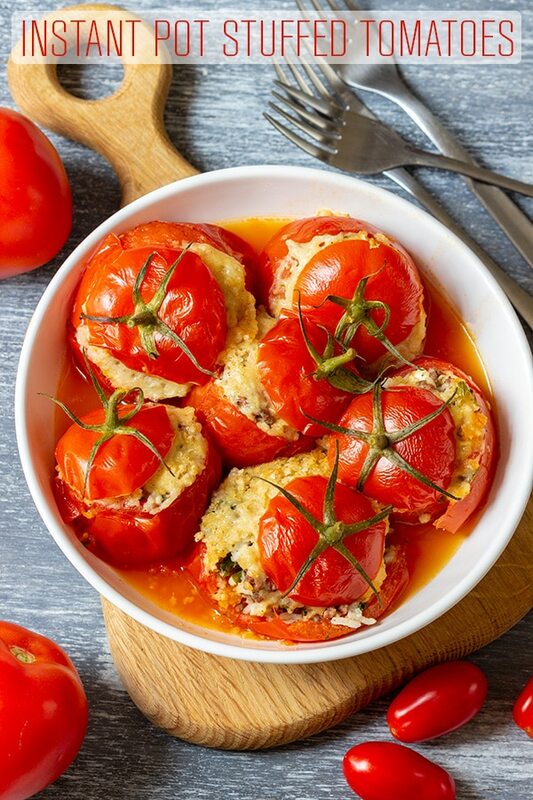 This instant pot stuffed tomatoes recipe is perfect for using your leftover rice! Also the prep can be easily done ahead. Cook rice and ground beef the night before and store them in an air-tight container in your fridge until ready to use. 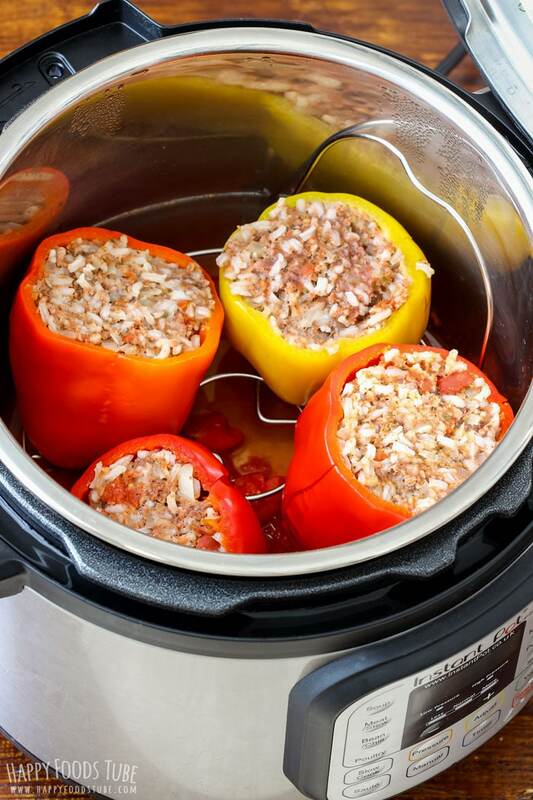 If you prefer peppers to tomatoes, I have another recipe for you: Instant Pot Stuffed Bell Peppers. 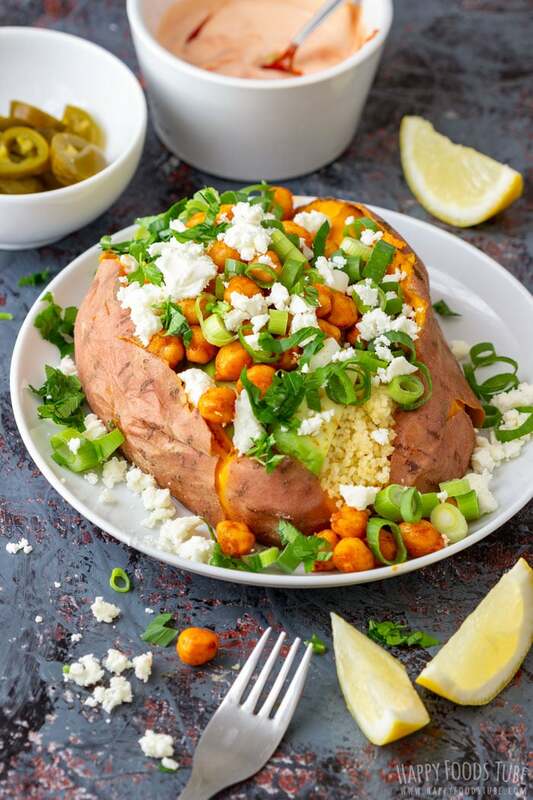 A delicious vegetarian option is a recipe for Instant Pot Stuffed Sweet Potatoes. They are also filling and protein-rich. Step one is preparing the tomatoes by cutting the tops off of each one of them. Don’t throw these away, just keep them for later. Next, scoop out seeds and pulp. I process this in a food processor and then pour it inside the inner pot of the pressure cooker. It yields about 1½ – 2 cups of liquid which is plenty for the 6-quart/6-liter Instant Pot. 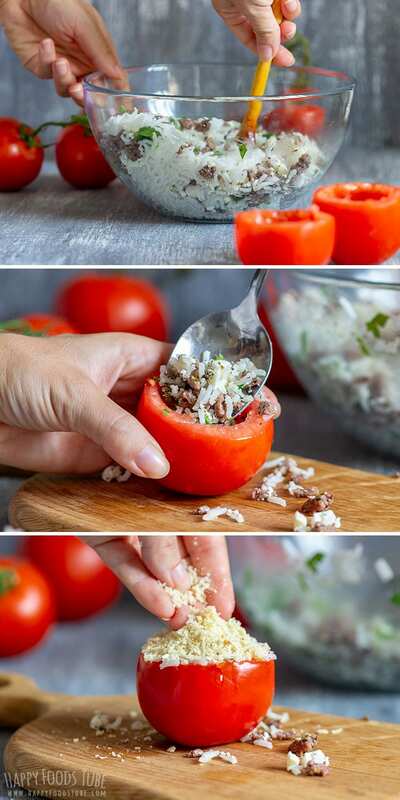 To make the filling for instant pot stuffed tomatoes mix the cooked rice with cooked ground beef, feta cheese and fresh parsley. The ground beef is seasoned with oregano, salt, pepper and garlic powder and cooked in a skillet/frying pan. Now all you have to do is stuff each tomato with the meat & rice filling, top it with a mixture of breadcrumbs and grated cheese and cover with the cut off piece. The active cooking time is literally 2 minutes. After, you just release the steam quickly and you are ready to serve! (If you have any doubts about the quick release, you might find this article helpful: What is a quick pressure release. It explains what it is and when to use it). 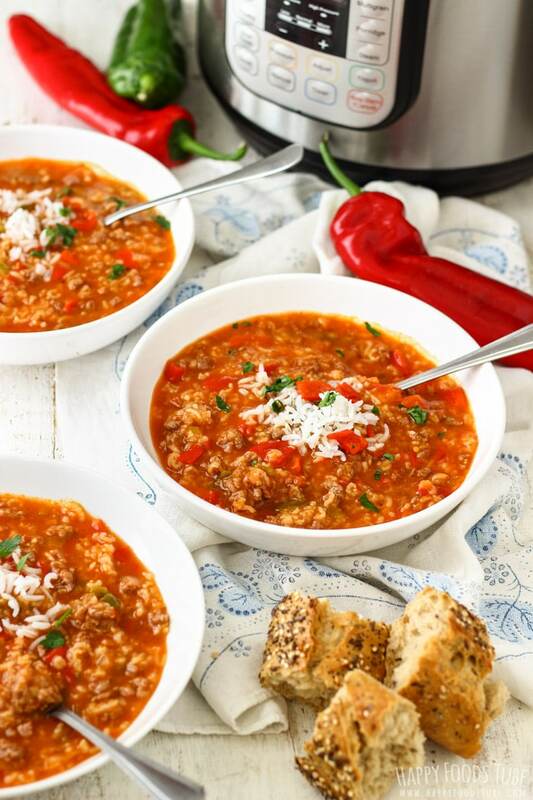 Guys, this is one of the Easy Instant Pot Recipes that you fall in love with right away. 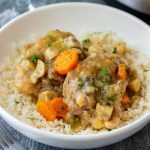 Instant Pot Chicken Risotto has been on our menu every single week since summer and we can’t get enough of it. It’s so simple and most importantly it’s a hassle-free recipe. I prefer buying tomatoes on vine as I can leave the green parts on each tomato. It is not necessary at all. 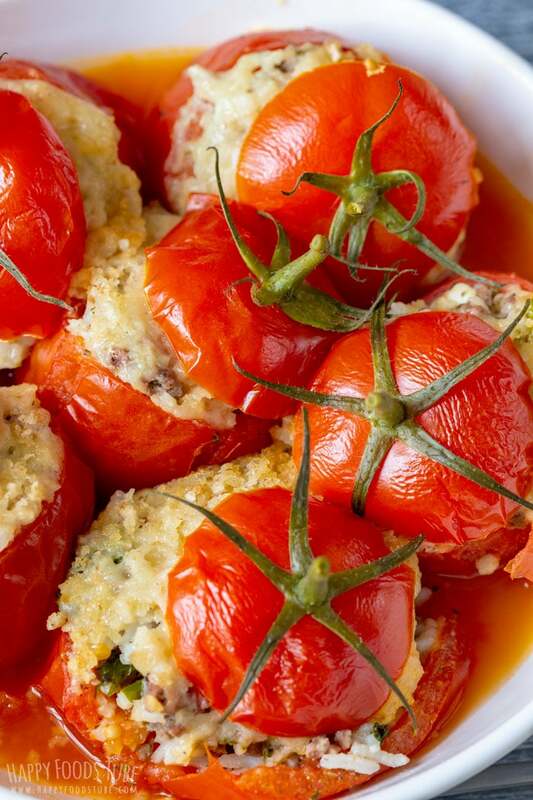 All it does is making these stuffed tomatoes look prettier. Now I pressure cook these instant pot stuffed tomatoes for 2 minutes and then I release the steam right after the cooking time is finished. If you leave them in longer they might end up completely mushy. The doneness of the tomatoes will depend on their size and ripeness. I suggest using firm tomatoes, not over-ripe ones. 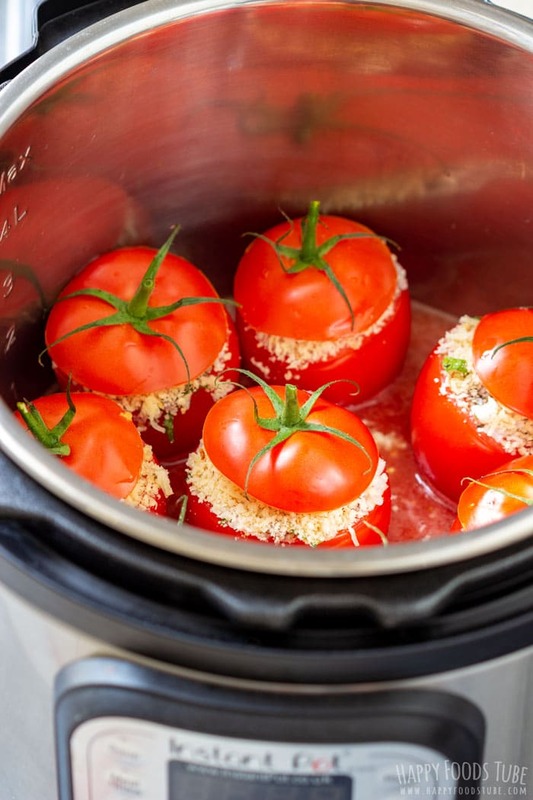 Also you can reduce the cooking time to 1 minute, if you prefer firmer tomatoes or using smaller ones. 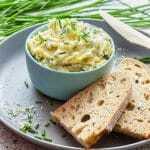 I used two types of cheese in this recipe. 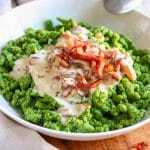 Feta cheese that is mixed with the filling and Parmesan cheese that is combined with breadcrumbs and tops each tomato. I find this works the best when it comes to flavor. 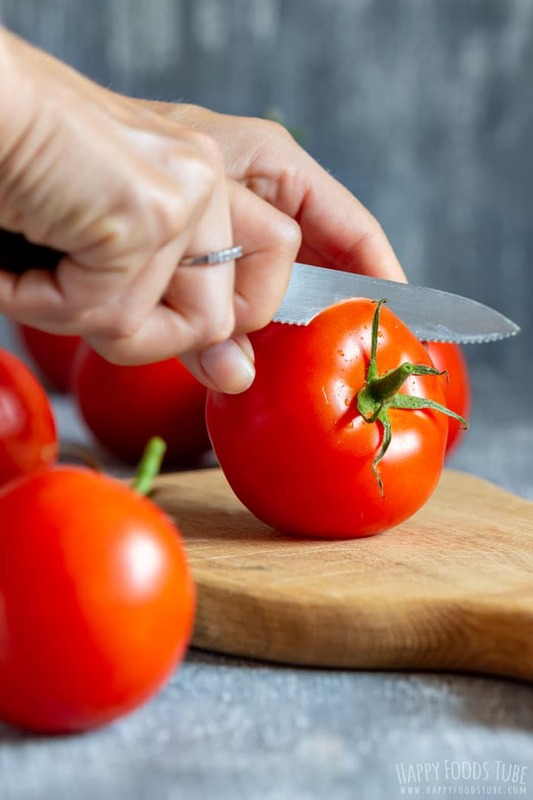 When filling the tomatoes, use a spoon to press down the filling mixture. This way you will fit more in each tomato. I am not using the trivet to place the tomatoes onto it and I don’t recommend using it. When these instant pot stuffed tomatoes are ready, they will be pretty tender. Placing them onto the trivet might result in them collapsing in between the gaps or losing their shape. WANT TO SEE HOW TO MAKE INSTANT POT STUFFED TOMATOES? WATCH THE VIDEO! Slice the top off of each tomato and save them for later. 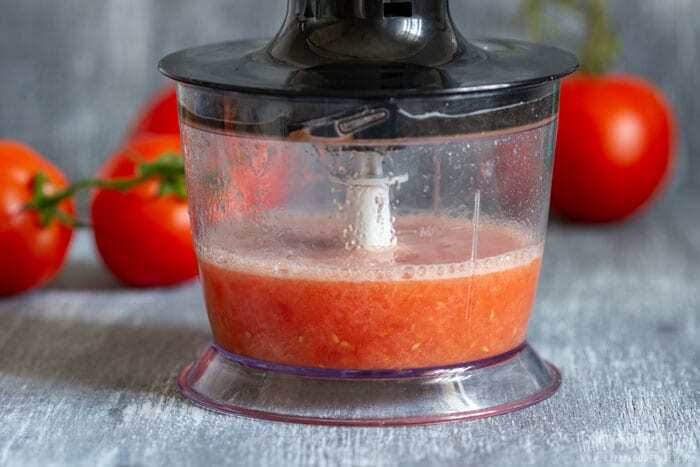 Using a teaspoon or melon baller, scoop out the seeds and pulp and place them into a food processor. 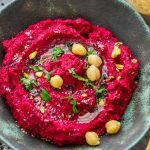 Process and pour this into the inner pot of your instant pot. In a skillet/frying pan, cook the ground beef with little oil, salt, black pepper and garlic powder. Make sure the seasoning and spices are evenly distributed by stirring it around. When the beef is cooked, transfer this into a mixing bowl. Add cooked rice, crumbled Feta cheese and finely chopped parsley. Mix together until well combined. You can taste it and add more seasoning, if needed. In a small bowl, mix the breadcrumbs with grated cheddar and set aside. Fill each tomato with the ground beef mixture, top them with the breadcrumb topping and place them in instant pot. Place the tops back on the tomatoes. Lock the lid in its position. Press MANUAL (pressure cooking) and adjust the time to 2 minutes. After the time is up, release the pressure right away (quick release). The filling should be enough for 8-10 medium tomatoes. The doneness of the tomatoes will depend on their size and ripeness. I suggest using firm tomatoes, not over-ripe ones. 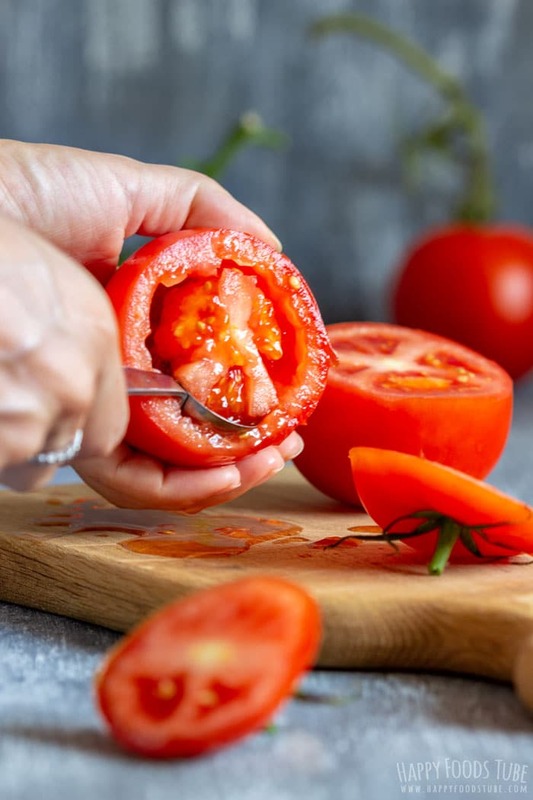 The cooking time can be reduced to 1 minute, especially when using ripe tomatoes as they will not need so much time to cook. 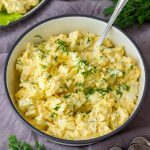 This recipe was developed for a 6-quart/6-liter instant pot pressure cooker. Add extra 10-12 minutes to the overall cooking time. This is the time needed for the pot to come to pressure. I used long grain rice to make this. 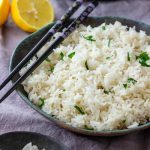 1¼ cup cooked long grain rice = ½ cup uncooked long grain rice (90 g). You can use other type of rice, if preferred. Sunflower oil can be substituted with vegetable oil or olive oil. These sound absolutely delicious. Love that you can make stuffed tomatoes in the Instant Pot..all the more reason to get one. Wow, two minutes!? That’s ah-maz-ing! Haven’t done stuffed tomatoes in the IP yet but I so want to try now!! Please let me know what you think if you do give them a try, Sarah! I never thought of stuffing tomatoes! Looks easy and delicious! Yay for instant pot recipes! And yay for this IP stuffed tomatoes recipe! I just got a bunch of vine tomatoes and was wondering what I was going to do with them. Now I know! 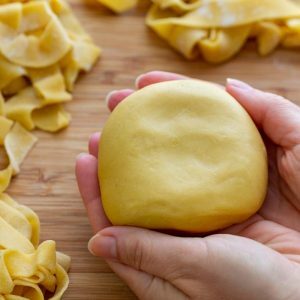 I am loving the fact that how easy is this recipe and is filled with tons of flavors. Tomatoes are in season. 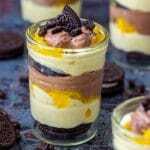 I am making this soon. 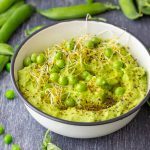 I can’t believe this only needs to cook for 2 minutes in the Instant Pot. 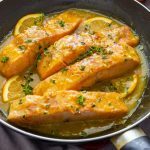 So quick and easy for a healthy and filling dinner. Can’t wait to try this! Assuming I have leftovers from your Instant Pot Chicken Risotto recipe, would that be an acceptable stuffing for the tomatoes? Johnny, I like the idea but haven’t tried it myself. I’d say it could be worth giving a try. If you do, please let us know how you liked it! Just keep in mind that risotto rice is different from long grain so the overall texture will be different.